The Holy Trinity Armenian Church is the only Armenian Church north of London, where there are two churches, St. Sarkis and St. Yeghishe. However, the Holy Trinity Armenian Church is the oldest church in the entire of the U.K. as it was built and consecrated in 1870. 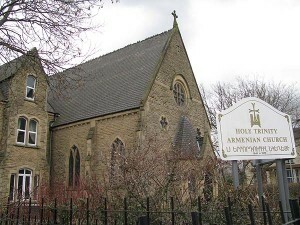 All three churches make up the Diocese of the Armenian Church of Great Britain. The Armenian Community in 1860’s were in a crisis, as their trade (manufacturing textiles) had slumped due to the American Civil War (1861-1865), which had caused a ‘cotton famine’. During this slump, the Armenian community decided to rent out a disused chapel on the outskirts of the city. Over the years, this became a focal point for worship and social gathering was required. A vartabed (celibate priest) was duly appointed, and the first Armenian Church service took place in the Runford Street chapel on Easter Sundy 1863. In 1867, Vartabed Kiuroyan, who initiated the plans to build a church and a vicarage, succeeded Vartabed Garabed Shahnazarian. They collected money from nearly 50 sponsors and contributions from London and Liverpool and eventually, a site was aquired, close to where several members of the community lived, in Upper Brook Street. By the end of 1870, the Holy Trinity Armenian Church and vicarage was completed at the cost of £2,725 and the first kahana (married priest) to be selected by the Churchwardens and approved by the community, was Kahana Nerses Balabanian. You may find some photos of the church in the photo gallery.